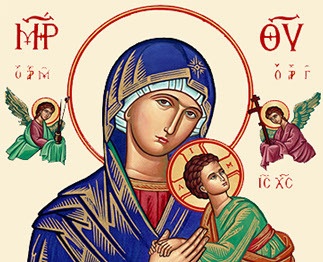 Our Lady of Perpetual Help Byzantine Catholic Church was established by +Most Reverend Michael Dudick, D.D. on October 1, 1989 to serve the spiritual needs of Byzantine Catholics in the southeastern part of Virginia and the northeastern part of North Carolina. It was the first parish for Eastern Rite Catholics in the Hampton Roads area. Fr. Edward Cimbala, pastor of Ascension of Our Lord Byzantine Catholic Church in Williamsburg, VA, was appointed as first pastor. The fledgling parish celebrated its first Divine Liturgy in the Eucharistic Chapel of St. Gregory the Great Roman Catholic Church in Virginia Beach. Liturgies were also celebrated in St. Francis Episcopal Church until the parish was able to move into their own church in November of 1990. The church building was constructed in 1913 by the Amish Mennonites and used by them until they sold it to the Virginia Beach Alliance Church in 1989. The building was sold to the Eparchy of Passaic on November 12, 1990 and the first Divine Liturgy was celebrated on November 21, 1990. The building was formally dedicated by +Bishop Michael Dudick on November 16, 1991. When the parishioners took over the church they faced the daunting task of transforming a relatively plain, almost stark building into a holy temple worthy of the liturgical celebrations of the Byzantine Church. Mr. Francis Ryan crafted and installed the icon screen. A classroom became the sacristy. Fr. Edward collected all the vestments and holy vessels for the proper celebration of the Divine Liturgy from a variety of sources. A storage room was transformed into a kitchen. Classrooms were turned into a social hall. Much of the work of renovation was completed through the hard work of the founding parishioners. Ronald Hatton served as the first Cantor. He later answered the call to priesthood and headed for St. Cyril and Methodius Seminary, and later returned to OLPH as pastor. Mr. Joseph Petro served as the first Pastoral Associate and assisted Fr. Edward with the everyday running of the parish. Joe's wife, Helen, began a baking committee and brought in much needed funds from the sale of various baked goods. A St. Nicholas Festival was established as a fund raising activity as well as a means to introduce the Byzantine Catholic Church to the Tidewater area. southwest and was replaced by Kathleen Zavada and Jacqueline Basalla. Joseph Petro served faithfully as Pastoral Associate for several years, and was followed by Steve Polansky. Our second pastor was Rev. Glenn Davidovich. Under his leadership the parish continued to grow and prosper. Mila Mina was hired to write new icons for the icon screen and the altar. When Fr. Glenn went on sick leave, Rev. Richard Kanar took leadership of OLPH. His tenure as pastor was only a few months as he too went on sick leave. Rev. Ronald Hatton, a parish vocation, returned to become the fourth pastor. On July 21, 2001 Joseph Bernard was tonsured and ordained to the offices of Candlebearer, Cantor and Lector. During Fr. Ron’s 11-year pastorate, the parish developed a deep sense of Byzantine Spirituality. New people continued to join the parish. The St. Nicholas Festival became the Eastern European Food Festival and expanded and enjoyed great success. The church building was painted throughout by the parishioners. The church proper was remodeled. The altar was elevated and proper ambon was created. Hardwood flooring replaced the carpet. The small kitchen was expanded into an office area to meet the needs of the baking committee. In March of 2006, Fr. Michael Krulak was assigned as pastor to Our Lady of Perpetual Help. During Fr. Michael’s ministry the church suffered considerable damage from “The Great Flood” that was caused by a water line break in one of the bathrooms. There were extensive repairs made to the foundation, flooring and wiring, plus carpeting and painting throughout much of the building. The parish also celebrated another vocation: Alex Cayetano entered Christ the King Benedictine Monastery in Nebraska, taking the name Brother Damian as he began monastic life. Fr. Alex Shuter arrived at OLPH in 2009, and continues to serve as pastor today. Under Fr. Alex’s guidance the parish has accomplished several large projects, including replacement of the heating and air conditioning system in the church and the dome that tops the building. The parish has begun an intergenerational education program that meets once a month after liturgy; the adults of the parish take turns acting as presenters for the various topics. The Eastern European Food Festival continues to grow and attract large crowds every second Saturday in November, and the parish regularly collects food and money to contribute to the social ministry work at several large Roman Catholic parishes in the area. The parish community of OLPH looks forward to many more years of growth and prosperity!